Preheat oven to 325 degrees. Beat 1 c shortening with an electric mixer until creamy; gradually add sugars, beating well. Add eggs and almond extract; beat well. In another bowl, combine flour, baking soda, baking powder, and salt; stir until blended. Add flour mixture to sugar mixture mixing until just blended. Slightly crush tortilla chips, only to the point there aren’t large pieces (but not too small, you’ll lose the ‘crunch’) Carefully stir in oats and cereal. Using an ice cream scoop, drop dough on a cookie sheet 2″ apart. Bake at 325 degrees 12 to 14 minutes. Cool for 2 minutes on cookie sheet before removing to a wire rack to cool completely. Melt almond bark in the microwave or double boiler and stir until smooth. 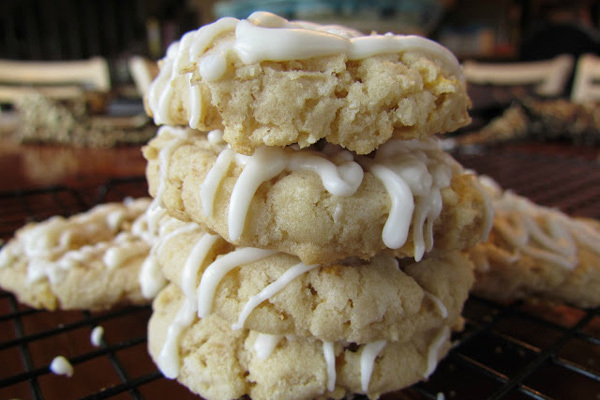 Drizzle over cookies as they cool by using either a fork or a decorators icing bag.